A mum has spoken of her horror after her four-year-old daughter was left "bleeding from everywhere" after a mass on her liver erupted overnight. 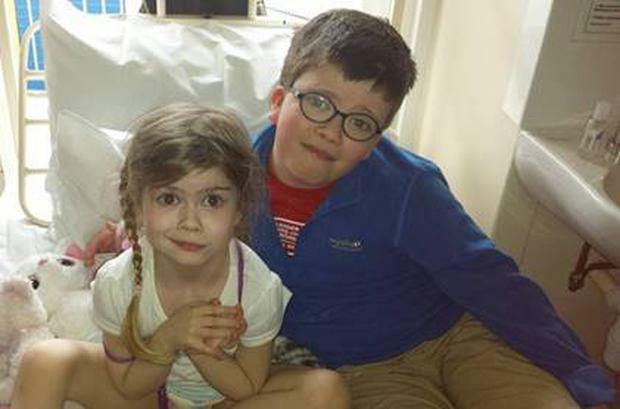 Three years ago, mum-of-two Susan Daly, was given the shocking news that her four-year-old daughter Olivia had a huge mass on her liver and would have to travel to Kings Hospital London for vital treatment. “At just four years of age, Olivia kept getting poorly with more and more infections and tummy bugs than she'd ever had before. I instinctively felt something was not quite right. "During Christmas week, in the middle of the night, we awoke to hear Olivia screaming. She had had a major internal bleed. What we faced in that bedroom was like a scene from a horror movie. "I felt that this couldn't possibly be happening to my child. I was frozen in shock - I just saw blood everywhere. We raced to A&E where everyone sprang into action. I could see that we were losing her, fast. Thankfully, my baby came back." Susan spent the next four months living on chocolate and microwave meals as she sat by Olivia's bedside in the UK. Most of her daughter's liver was removed. Luckily, Olivia narrowly avoided a liver transplant, but this possibility still remains on the cards. "I was trying to come to terms with it, trying to cope. I tried to keep a degree of normality because you can't be frantic all the time. But everywhere I went, like the supermarket, well-wishers would rush over to say how awful it was and how sorry they were. You get just so worn out. "People mean so well and try to help but they have no idea what you are going through, and I pray they never do. As soon as I put the kids to bed, I would cry my eyes out. I was so angry with myself for crying but you can't be brave all the time." Susan had to give up her job as she was in between appointments at Crumlin Children's Hospital in Dublin and Kings Hospital in the UK. "I had to stop working. But the bills don't stop. We fell behind. Everything started adding up, flights, medicine, everything. You can barely put one foot in front of the other, so applying to the bank for help was just not an option." The Cliona Foundation stepped in and helped Susan with some of her everyday costs. Terry and Brendan Ring, founded Cliona’s Foundation in honour of their daughter Cliona (15), who died in 2006 from an inoperable brain tumour. “Unless you’ve been in the position of having a really sick child in your family you don’t know how quickly expenses can mount up. We want to support families who are already going through the horrific trauma of dealing with a very ill child shouldn’t have to face dealing with money worries on top of that," Terry said.